Hello my friends! I hope you had a great week! We just got back from a great week away in North Carolina. Our son did the Duke basketball camp and we can't recommend it enough. It was a fantastic program and we'll be back next year for sure. Now we're back home and I'm refreshed and ready to tackle stuff at home again. I have a new energy about a lot of projects and my mind is swimming with things I want to get done. But you know what? Over the past couple of years I've mostly conquered it. Almost. Enough that I don't feel like it takes over our kitchen table and my car anymore. These are my tips on mail specifically -- when it comes to papers from school, good luck to you my friend. :) No really, I do try to handle that stuff immediately, and whatever we need to address hangs on the command center in the mud room. That process does work well for me. 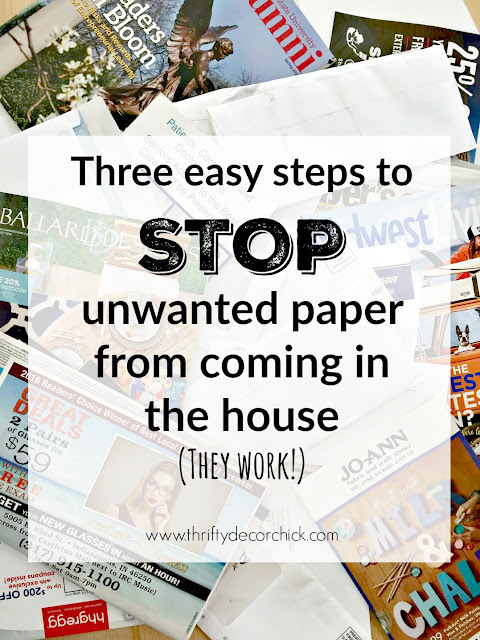 This is for those of you who want to try to control the paper and lessen what you bring into the house. These tips work and I promise your paper load will lighten if you try them yourself. I will address what I do after all of this in a future post. If you can go electronic -- do it. We have already with many companies, but still have a list to go. Also, it takes mere seconds to log on to see a specific statement. I used to keep them all in the file drawer and that took a lot more time to dig through. Most companies will gladly switch you over and I find it far easier to keep up with. And LESS MAIL. That is our goal folks! I looove a good catalog. They are my jam. But sometimes we grow out of them, I just don't care to get them anymore, or we get on a list we don't want to be on. If this is the case for you, try Catalog Choice. I've used it for years and it works. You have to create an account and then you can search literally hundreds of catalogs to unsubscribe. It's awesome and within a couple months they will stop coming to your door. I made the mistake of signing up for Restoration Hardware once…and if you get them you know that their catalogs are RIDIC. I feel like I kill a tree every time they send them out. This is a great option to lessen the load in your mailbox and in your house. 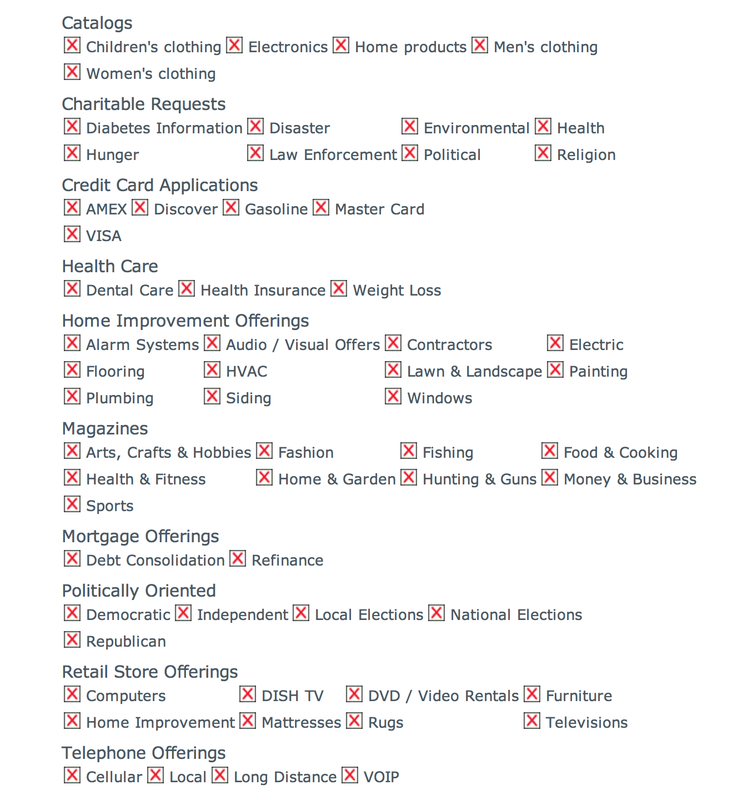 Also, did you know you can opt out of all kinds of offers and junk mail? Many don't realize this but it helps lessen the paper you'll bring into your home tremendously. I use DMA Choice for many marketing mailings. Sign in and you can opt out of catalogs, credit offers and magazine offers. Remember you'll need to do this for each of you in the home who get mail. Marketers focus primarily on women in the household so even if just the woman does it, it will help tremendously. Ours are white, not clear, and IKEA has nearly identical ones for a lot less. I like the ones with lids so they keep the items contained. When I keep up with this -- getting rid of most of it before I even walk in the house, the paper clutter is kept to a minimum. 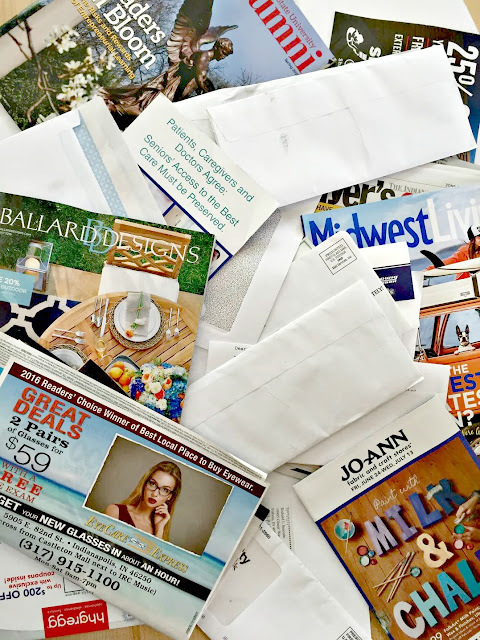 All of these tips work to bring you less mail and paper to begin with. You can tailor them to what you want and can alway go back and edit most of them if you change your mind. I can guarantee the paper you'll bring into your home will lessen within two to three months. And that is the first and most important step to getting control of it. Do you have any tips when it comes to mail? I'd love to hear them! Thank you for cluing me in to Catalog Choice and DMA Choice. I didn't know they existed so I'll be contacting them asap. Why do catalog sellers seem to believe it's ok to share their customers' names and addresses with third parties, when they have not been given permission to do so??? A single catalog purchase usually triggers an avalanche of unsolicited junk mail that persists for YEARS. It's mail that was never asked for and is not wanted. The practice is so common and annoying that I've stopped ordering stuff from catalogs altogether. I now buy whatever I can't source locally from Amazon, which thus far appears to have the good sense to keep its customer lists confidential. Catalog companies ought to wake up and smell the coffee! great post, thank you sarah! subscribing to magazines also gets you on junk mail lists, even if you specifically ask them not to share (sell?) your information. one concern about the bin in the garage: privacy. once that junk mail is picked up by the trashmen, you never know who might see it. its good to remove any personal information from discarded junk mail, especially the credit offers. better to be safe than sorry. Great post. Definitely one of my biggest issues too. It's true! We all should be nature sensitive and act like more responsible person. Above mentioned 3 ideas are awesome to stop unnecessary stopage of paper. Sometimes it becomes really difficult to manage clutter in the house. I started a system a few years ago that has been incredibly impactful. I got a small (and pretty- so I don't mind it sitting on a shelf) file box. I made a few folders such as ads, current bills, shred, to file, and one for the kid's school. Each day I deal with all of the mail, either recycling or placing into one of these folders. When a bill comes in with confirmation that they received my last payment, I move the old bill to the shred folder. I shred once a week and file the "to file" folder once a month. This has dramatically cut down on paper clutter in our house! I still get the paper copies of bills & statements, but I have a home-based business so I still need a lot of the papers for tax documentation. Why should I have to use my paper and ink to print out the documentation? But, I've gotten smarter about retention. I have a "this year, last year, tax docs and need to save filing" system. The rest I am shredding after the tax returns are filed. And I get rid of excess paper asap. 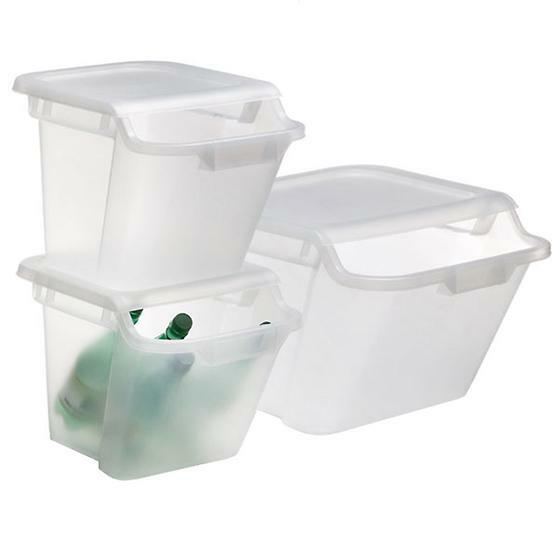 I have three small stacking buckets that I use - trash, recycle and shred. Re getting bills online - make sure you check your spam folder. My neighbor always had her credit card bill put in that bucket and had to pay late fees since she didn't see the bill. And, as you get older (like me), you may want to switch back to paper or make sure that your executors know your passwords to email and have a good checklist of emailed-bills. My sister/nieces would have no idea what I have outstanding if I don't leave a good trail. I was lucky in that both my Dad & Aunt left good trails for me to follow - Dad left me a binder of info. Those bins are PERFECT! I am searching for them NOW but haven't been able to locate them at the Container Store website. Any chance you know the name of them or the ones from Ikea?